A radically different, yet profoundly simple approach to the process of Self-actualization. A transcription of a four-day lecture series in New York City, How to Be Your Own Best Psychotherapist is a tour through your inner landscape that concludes with a healthier, wiser, and happier you. This book was edited and re-edited, eventually becoming over-edited, to the point we do not recommend this book. 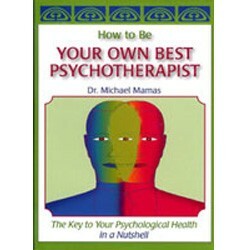 It is not a true reflection of Michael Mamas and his teachings, as are his other books. However, we have it available for historical purposes.